In 2009, an ODI series loss against India at home was sufficient cause for the Sri Lankan selectors to entertain the idea of a change in captaincy. Just days after the defeat, Tillakaratne Dilshan was named captain for Sri Lanka's maiden Twenty20 international on home soil. Mahela Jayawardene, who up until that point had been Sri Lanka's captain in all formats, found himself sidelined. 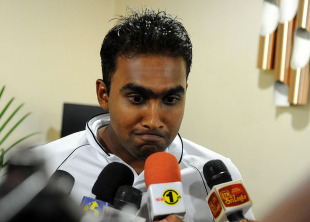 Shortly after, Jayawardene announced he was stepping down as captain. Two years and two captains later, Sri Lanka have been forced to go back to Jayawardene, hoping that he can somehow change the fortunes of a team that is facing an unprecedented decline. Dilshan, fans and pundits argue, was never captaincy material. But the selectors had few other options, when Kumar Sangakkara unexpectedly resigned at the end of the World Cup last year. In fact, during the World Cup, Jayawardene served as Sangakkara's deputy, before tendering his resignation once again. While there isn't a better candidate now than the 34-year-old Jayawardene, one wonders who will lead Sri Lanka come the next World Cup. In all likelihood, barring injuries, vice-captain Angelo Mathews, 24, is the likely candidate. The question then begs to be asked: when should he be given the reins? The need to groom a captain for the World Cup in Australia and New Zealand will be foremost in the minds of the new selectors. In the wake of successive series defeats in ODIs and Tests, the shake-up was inevitable. The sports minister, Mahindananda Aluthgamage, who has taken a keen interest in cricket, said that it was the "responsibility of the Sri Lankan government and the sports ministry" to enforce "stern and appropriate action" in order to make Sri Lanka "the number one team in the world". Sacking Australian coach Geoff Marsh when he was just three months into his two-year term is a part of that plan. Perhaps his replacement, Graham Ford of South Africa, was unaware that by accepting Sri Lanka's offer to replace Marsh, he would become their fourth coach in 12 months. Scattered among the many lows of late, were moments of brilliance in trying circumstances, which offer proof of what the Sri Lankans are capable of. But events beyond their control, including being unpaid for almost a year, have hindered them. The way forward is murky. Ford and Jayawardene will have to contend with many of the issues their predecessors faced - inconsistent, politically motivated, and at times even bizarre, selections, interference from the ministry of sport, and catastrophic administrative blunders orchestrated by unqualified government henchmen. Unless cricket administration in Sri Lanka is completely rid of government control and interference, and rid of administrators who have been riding the gravy train for far too long, Sri Lanka will continue to be a team on the decline. "Good teams like Australia usually have got strong or good management backing the team up. That's an area in which we can improve here," were Trevor Bayliss' parting words. The former coach said that he was "amazed how well the players do, with all the distractions put in front of them". The distractions, though, appear to have finally taken their toll; the World Cup finalists have lost four consecutive Test and ODI series since Bayliss' departure. The administrators, and the politicians who back them, bear much of the responsibility. In an attempt to arrest the slide, the selection panel headed by the multi-skilled Duleep Mendis, who had been employed by the board in various positions for over a decade, and is rumoured to be making a return as team manager, was replaced by the sports minister last week with a new panel. Ashantha de Mel, who was sacked in 2010 amid allegations of political bias and favouritism, was reappointed as chief selector by the sports ministry. The move prompted an outcry from journalists of several independent English dailies on the island. During his previous tenure de Mel was the only selector to travel overseas with the team on every tour, but was seldom spotted observing upcoming talent at domestic games. The former fast bowler has also served on one of Sri Lanka's many interim committees in the past, and was employed at one time by the government as the chairman of the Ceylon Petroleum Corporation, where he was removed after the country's supreme court faulted him for entering into "iniquitous" contracts. Similarly, at the recent cricket board elections, two men with ties to the government, Upali Dharmadasa and Nishantha Ranatunga, were elected uncontested for the post of president and secretary. Ranatunga was the secretary of the dissolved interim committee that is responsible for the dire financial state the board finds itself in today. He, like de Mel, has also been employed by the state in the past, serving as the director general of a state-owned television station. Although a new coach and captain have been appointed, the board is still firmly in the hands of men with poor track records, seemingly positioned there by politicians. Despite the recent overhaul, there appears to be no end in sight for Sri Lanka's troubles.